What is the best dog food? What is the food dogs love the most? What is the most nutritional dog food out there on the market? Can i find a well-balanced dry dog food that my dog would actually love? Not every dog foods are created equal. The quality of pet food varies from one product to another (and one manufacturer to another). Therefore, buying the most expensive dog food out there is not much of a smart decision. Instead, you need to see what dog food will benefit your dog and find a quality product. In today’s guide to dog food, we are going to answer all of these questions. Whether you want to change the food you are giving to your furry friend or try something new, below you will find the most nutritious and healthy foods listed. We are starting the review with a list of the best dry dog food on the market. This Dog Food Buying Guide for 2018 has few sections... Use the buttons below to quickly navigate to the type of dog food you are looking for today. If you didn’t knew it before, dry food is the most convenient type of food for storage and feeding. Also known as dry kibble, this food can be left out to the pet to eat at its own pace without any fear of spoilage. All you need to do is fill up the bowl with enough food for the day and leave your dog with it. This package basically comprises of wild roasted food from bison. Real meat is the main ingredient, with added amino acids and proteins for lean and strong muscles. Whether it’s a pup or a large breed dog, this dog food is natural with added vitamins and minerals as well as fruits and vegetables. There are even superfoods which act as the best natural antioxidants and fatty acids for optimal skin and coat health. 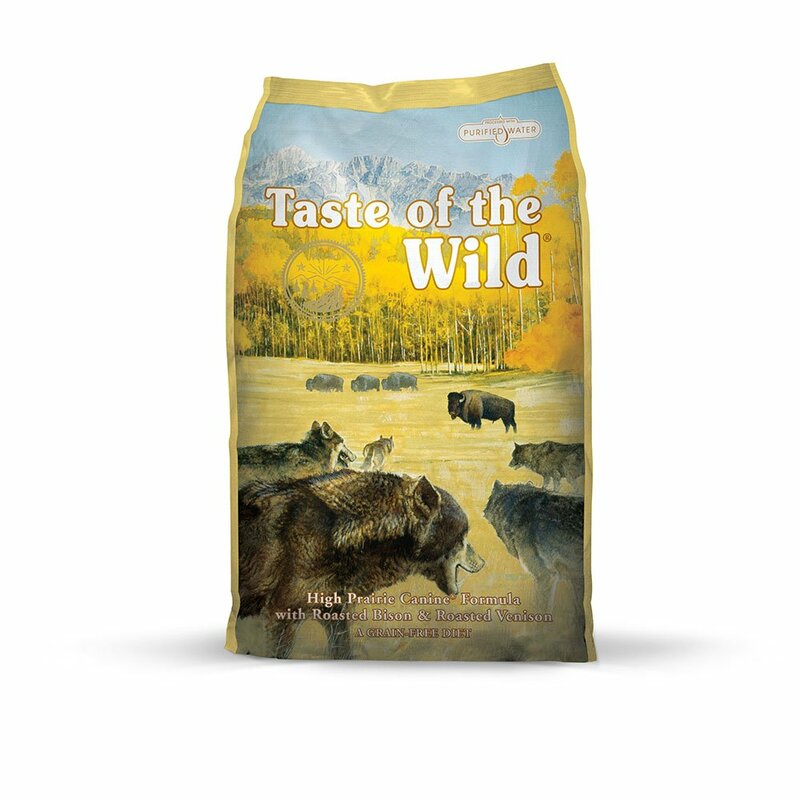 Nutrient rich and highly digestible, the dog food by Taste Of The Wild is made in the USA with the most scientifically advanced food safety protocols. There are no artificial flavors, colors, preservatives or fillers. The adult large breed food by Hill’s Science is recommended by many dog owners. However, it is important to note that this package is best used for adult dogs who weigh more than 55 pounds. As a source of natural ingredients such as glucosamine and chondroitin, it will support the joint health and mobility of your pets. There is even a protein source included which adds up to lean muscles and a healthy weight of your dog. Vitamins, omega (fatty) acids and other nutrients for nourishing skin and promoting a shiny coat are also inside – all clinically proven and recommended for adult dogs of 1 to 5 years of age (55 to 110 pounds) and giant breeds 1 to 4 years of age with an ideal weight of 110 pounds and more. It is not recommended for large breed puppies, pregnant and nursing dogs. 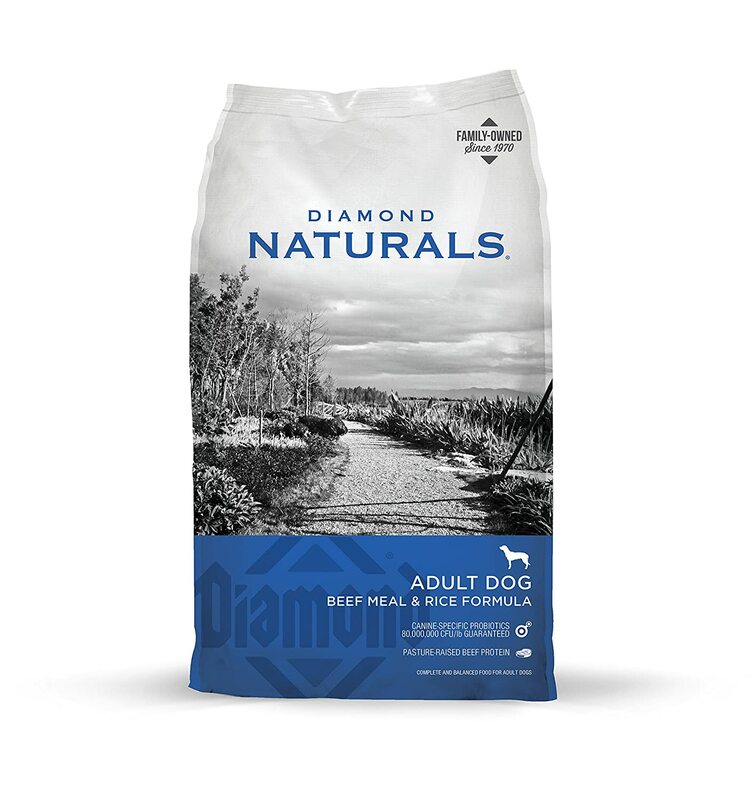 When it comes to the adult dry dog food by Diamond Naturals, you can choose from a variety of flavors. From lamb to chicken, there are flavors and different packages for large breed puppies, small breed puppies, adult dogs, extreme athletic dogs, adult large breed dogs and dogs in all life stages. The packages come in all sizes from 6 lbs to 40 lbs. 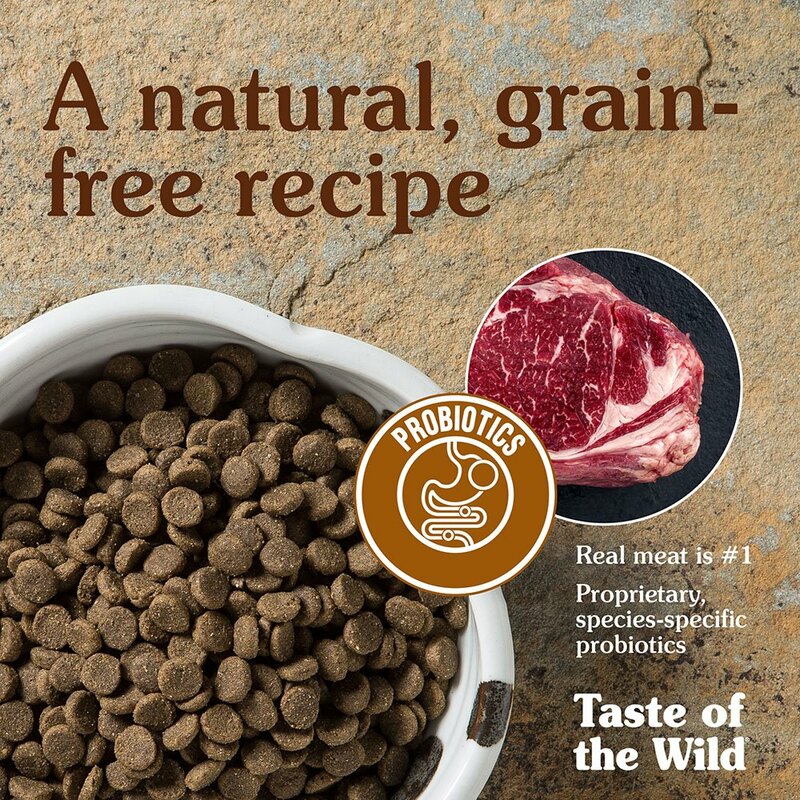 That being said, this is one of the best dog foods in 2018 which specifically tailors to your dog’s needs and is made with real pasture raised beef. This makes it ideal for adult dogs to thrive and get the lean, strong and well-shaped muscles. 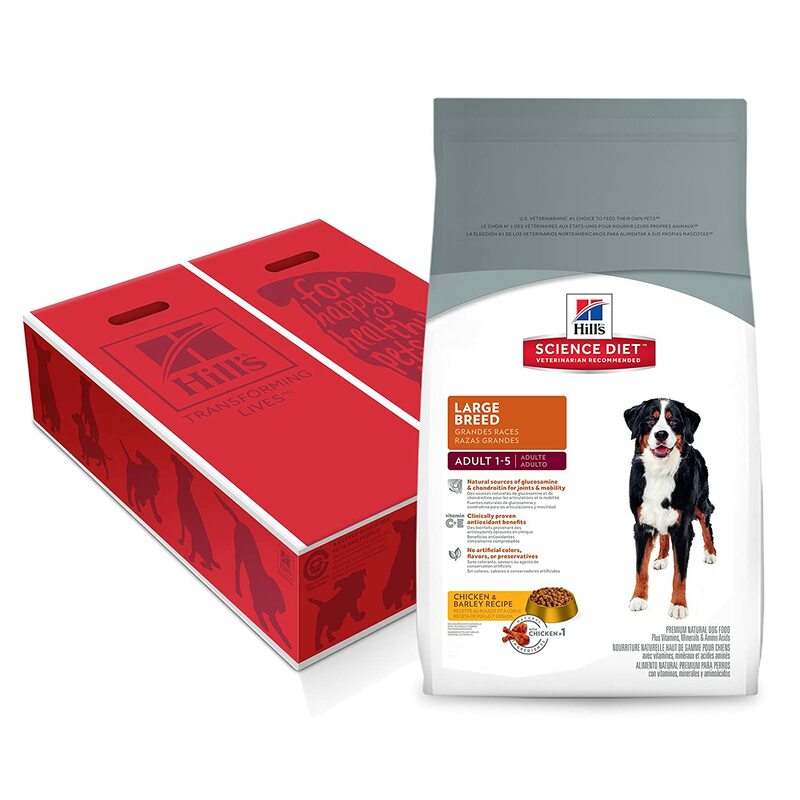 With no artificial flavors, colors or preservatives – this dog food combines the very best of fruits, veggies, superfoods, antioxidants and a unique fatty acid blend for skin and coat nourishing. Pedigree is one of the leading brands when it comes to dog nutrition – and this dog food is a proof for that. Available in 3.5, 7, 16.3 and 36 lbs. Packages, this is basically a product that features a delicious chicken flavor with all the antioxidants, vitamins and minerals that will help your puppy maintain a healthy lifestyle. Plus, the dog food is formulated with DHA to promote optimal brain development of growing puppies. 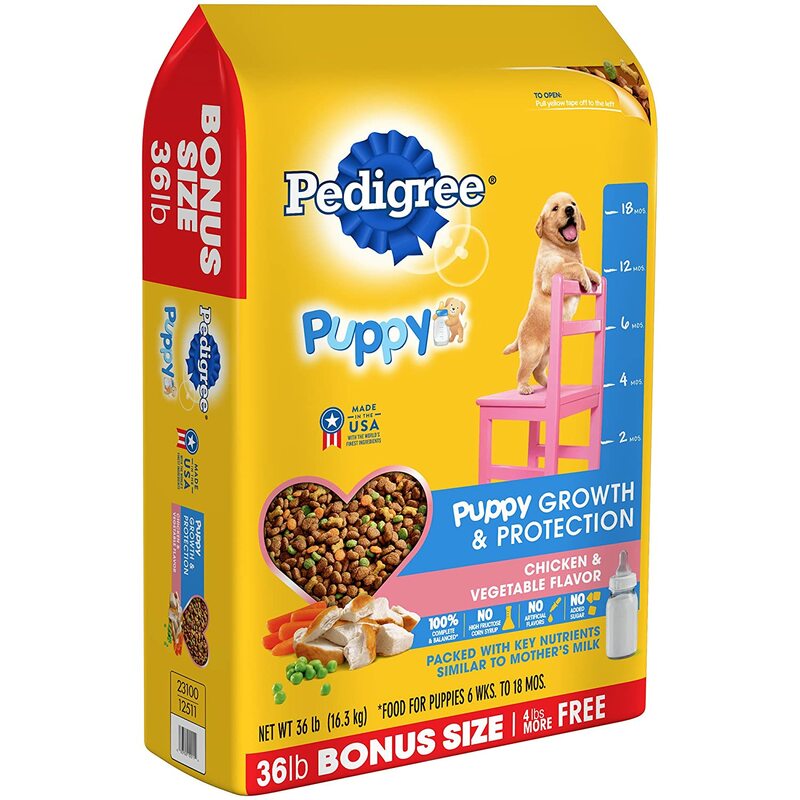 The Pedigree Puppy Growth formula is incorporated in this product with a complete and balanced nutrition that provides the optimal levels of calcium and phosphorus to help puppies develop strong teeth and bones. Note: This dog food is meant for puppies. 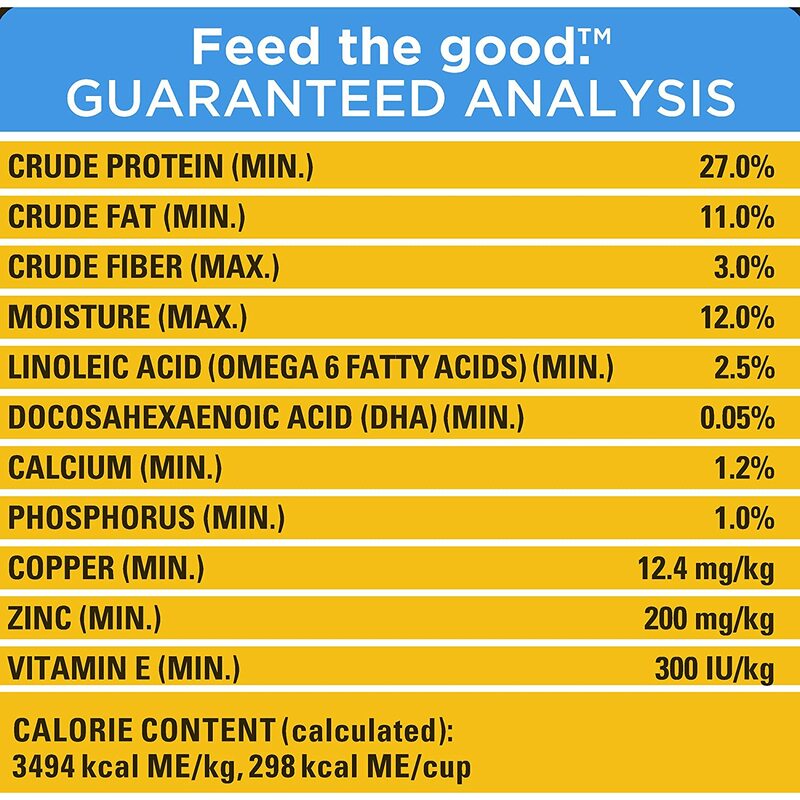 If you want the same mixture for your adult dog, opt out for the Pedigree Adult Complete Nutrition Chicken Flavor Dry Dog Food. Royal Canin is another dog food brand that is known for their quality products. The Shih Tzu food is basically a formula that is best used for puppies. Enriched with an exclusive nutrient complex, it includes EPA, DHA and Vitamin A which helps puppies maintain a healthy skin, teeth and bones. Additionally, this dog food helps maintain the favorable balance of the “good bacteria” in your dog’s body which promotes digestive health. The nutrients promote a healthy digestive system and contribute to reduced stool odor and volume. Note: This dog food is for puppies aged between 8 weeks and 10 months. 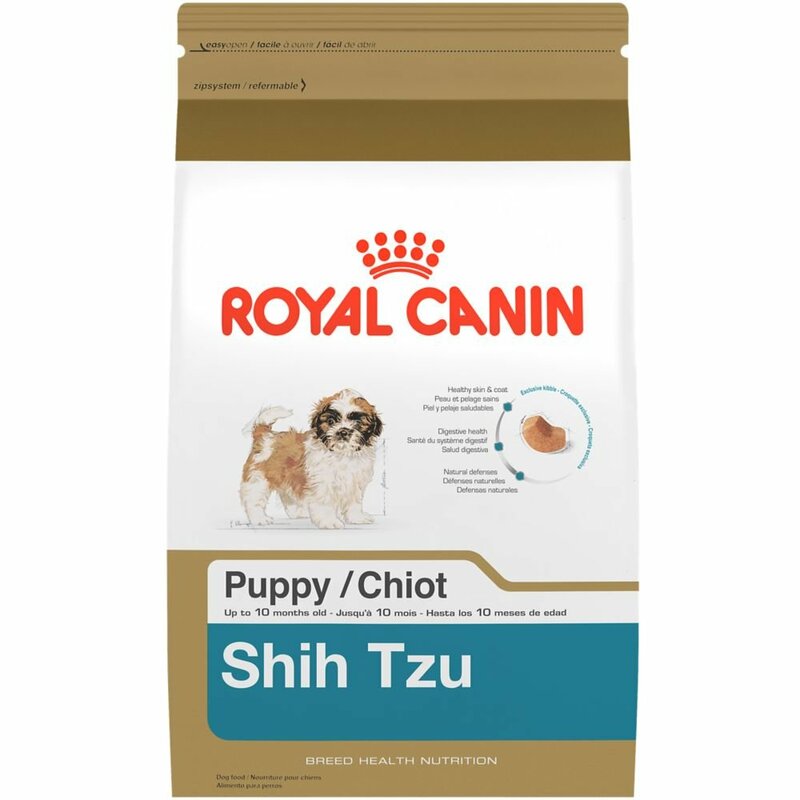 If you want the adult package, check out the Royal Canin Breed Health Shih Tzu Adult Dry Dog Food. Now that you know what the best dry dog foods are, it’s time to introduce you to the five top-rated wet dog food products on the market. Basically, wet dog food differs from dry with the fact that it contains more water mixed with the ‘dry’ ingredients which helps your dog to hold the kibble together and gives them more energy. This also means that the product weighs much more than the product – whether it comes in a can, pouch or tray. Therefore, transporting and shipping the wet dog foods is more costly and this nutrition is seen as ‘more expensive’. However, it helps a lot if your dog is suffering from dental problems or needs more hydration. This wet dog food is available in a range of flavors including chicken, beef, duck, turkey and many combinations and varieties. The idea behind it is that your dog doesn’t deserve to eat the same thing every day – which is why you should equip yourself with these different flavors and give your dog a well balanced diet. 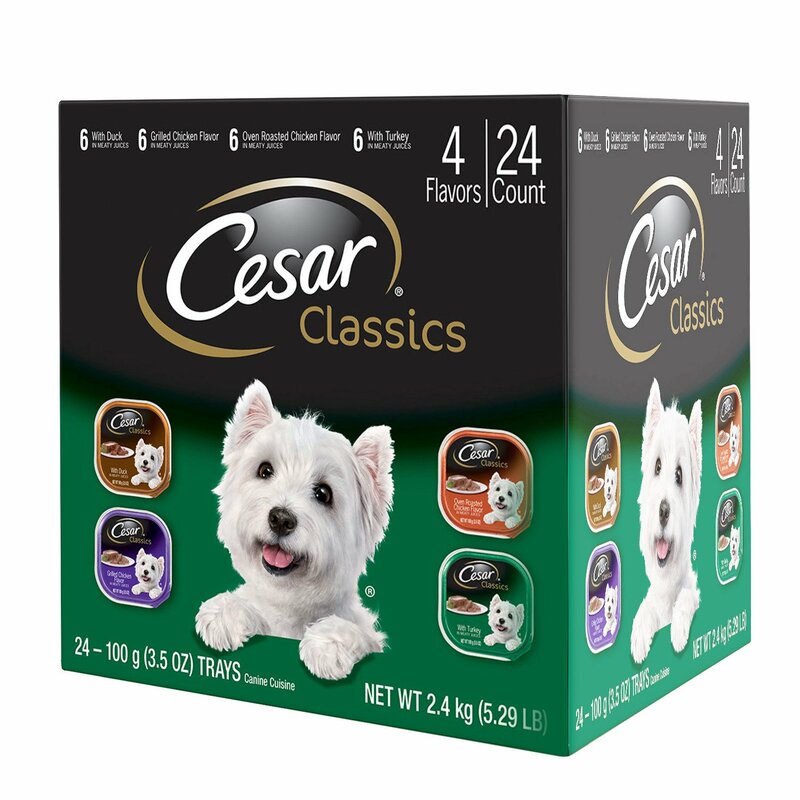 With more than 40 flavors, the CESAR wet dog food is one of the top-rated products out there. Moreover, it provides a complete and balanced nutrition that includes all the right ingredients such as vitamins, minerals and proteins. The delicious recipes is loved by many dogs worldwide. 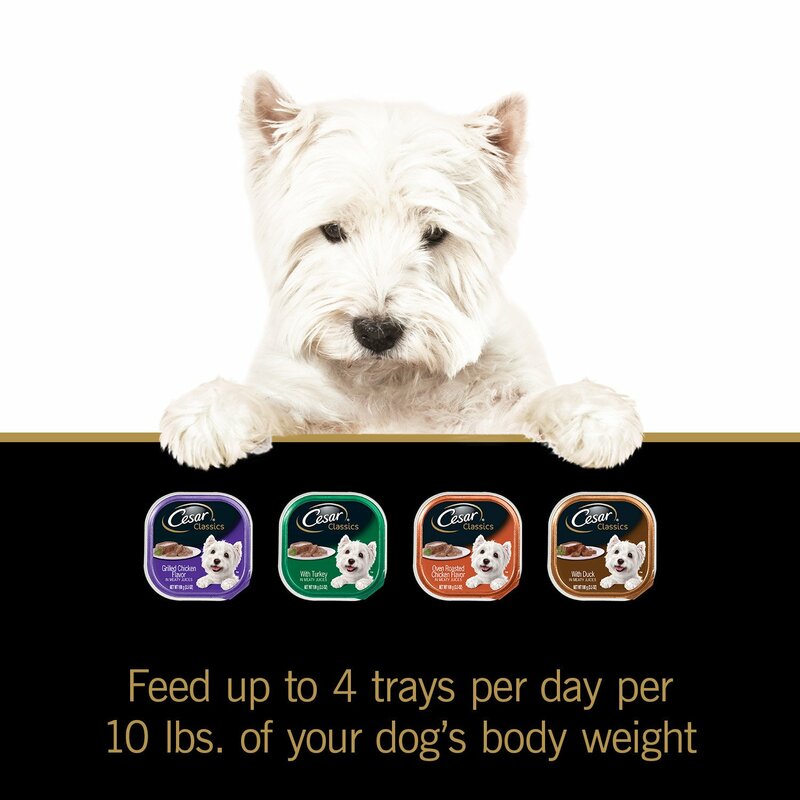 The ideal serving is 3 trays daily per 10 lb adult dog. 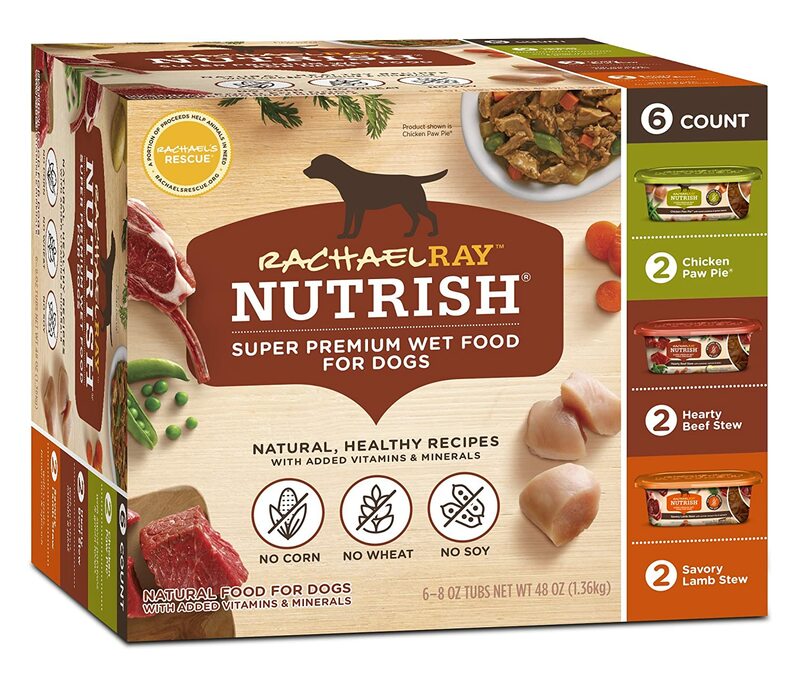 This natural wet dog food product by Rachael Ray comes in a pack of 6 or 8 trays – all made with real meat and with added vitamins and minerals. 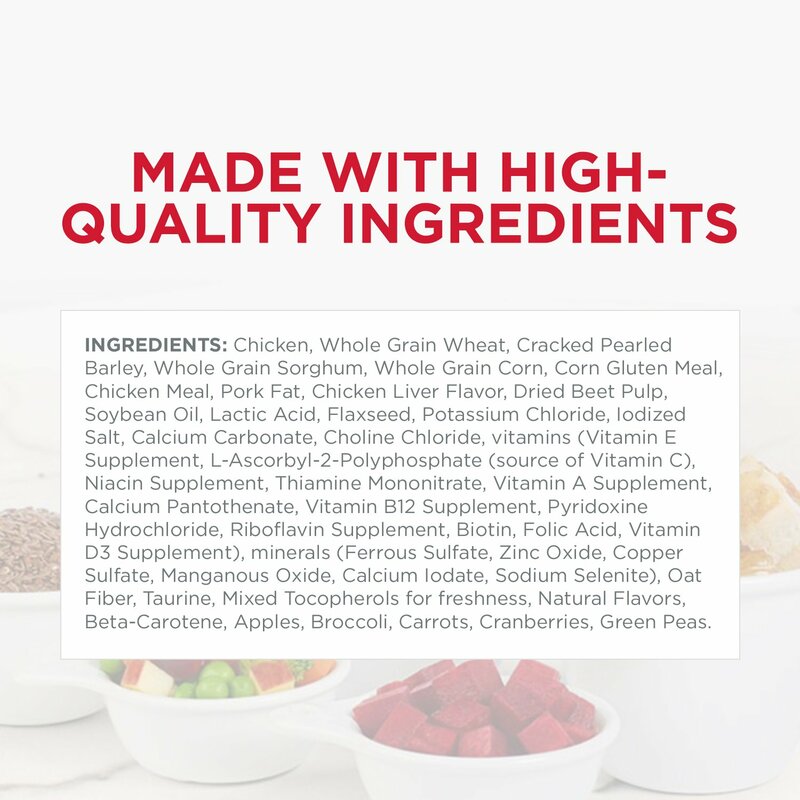 There are no corn, wheat or soy fillers or meat-by products – and no artificial flavors or preservatives. 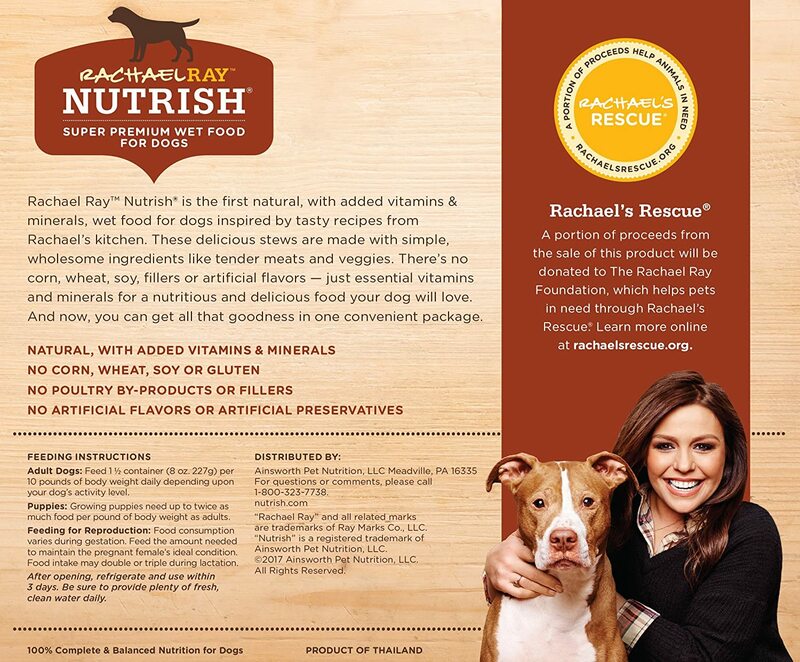 Instead, the dog food is based on real recipes inspired by Rachael’s kitchen and real ingredients that naturally make the food so good. 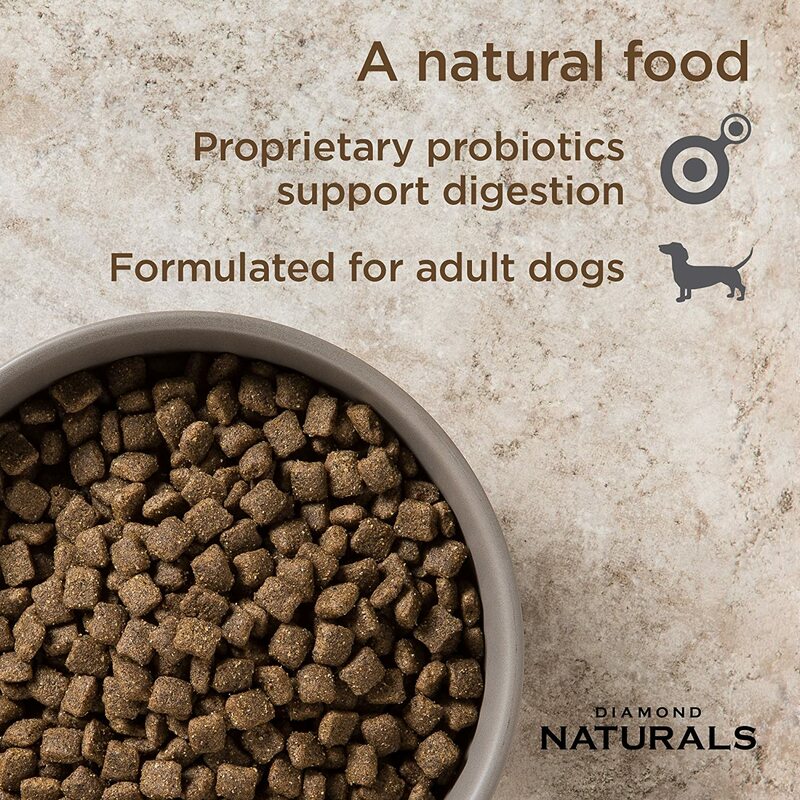 As Rachel herself claims, every ingredient has a purpose which is why this wet dog food combines the best proteins like chicken, salmon and whitefish – accompanied by wholesome veggies, essential vitamins, minerals and taurine. 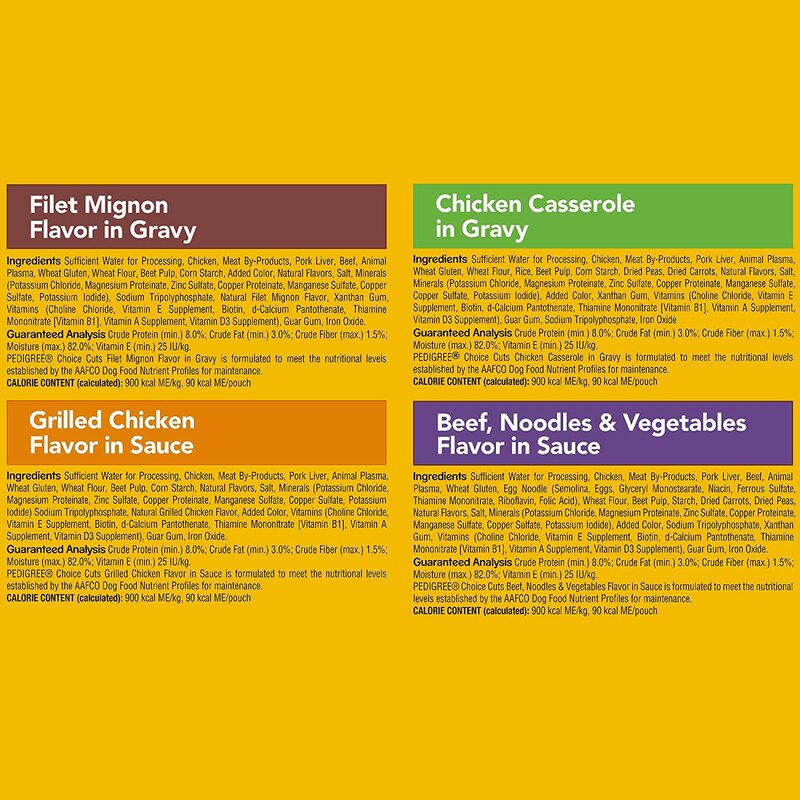 The Petite Eats by Nutro are basically a variety of chicken, lamb, beef or turkey flavors – or a combination that you will choose yourself. There are two options when it comes to the packaging too – standard and frustration-free packaging which makes serving the wet dog food to your furry friend super easy. When it comes to the recipe itself, it is specially crafted for healthy skin and coat and is enjoyable for both small breed and large breed dogs. There are no by-product meat products, soy, artificial flavors or artificial preservatives. Only recipes that are enjoyable for both small breed and large breed dogs. 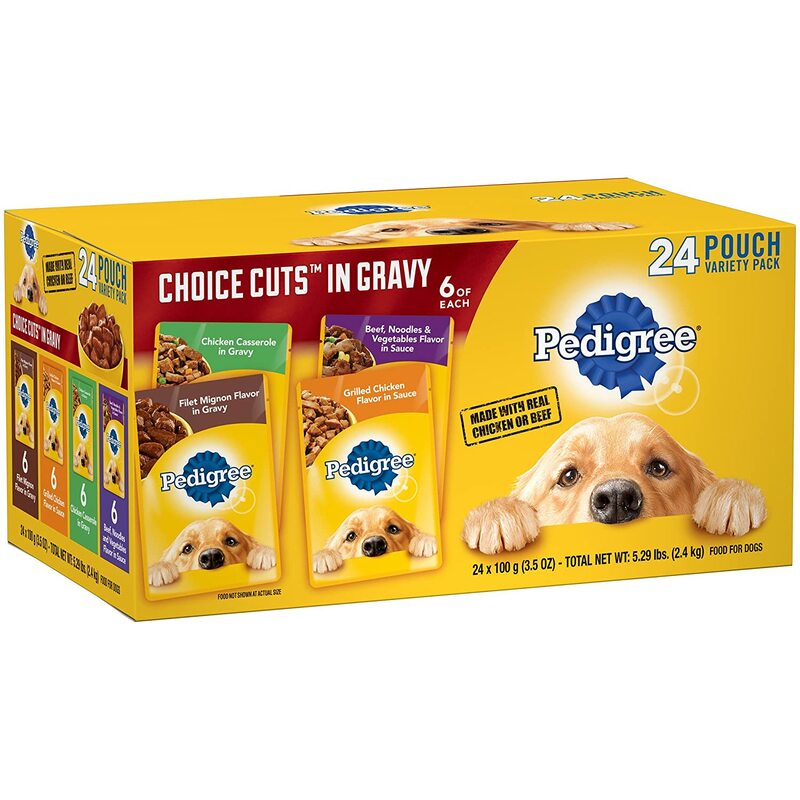 If you are a fan of Pedigree, this wet dog food option is something you should definitely consider. 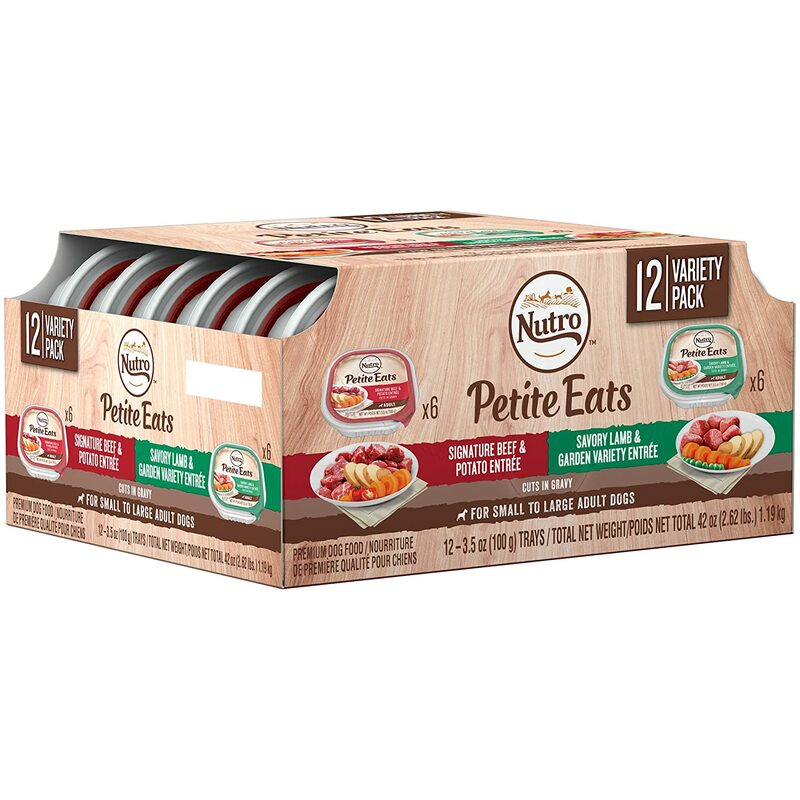 Coming in sizes of 16, 18 or 24 pouches, it contains a variety of food options including Filet Mignon pouches, Grilled Chicken pouches, Chicken Casserole pouches and Beef Noodle pouches. Usually, all of these tastes are divided in equal numbers. What’s great about this product is the fact that it contains calcium to support strong bones and healthy teeth. Also, there are oils and minerals which nourish your dog’s skin and coat. According to many, this is the extra-savory meal that your dog deserves to be treated with. Plus, it is very convenient and easy to open – single serve and without messy leftovers! 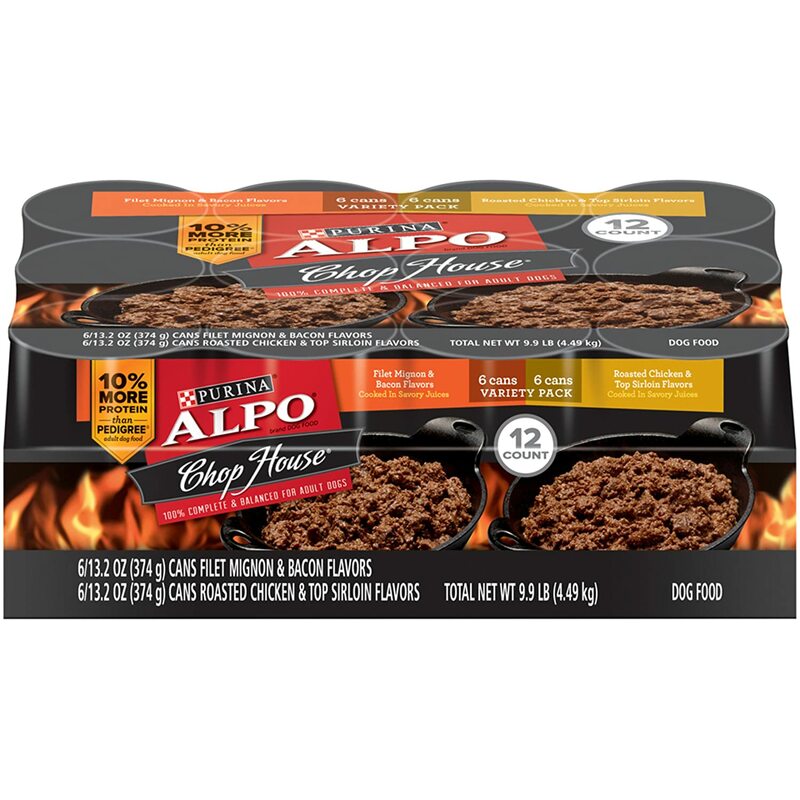 This product comes in a twelve cans and is made with real chicken or beef. It basically uses savory gravy for added flavor – and the tender texture contains high-quality protein sources. With it, you can give your dog a crave-worthy mealtime option and let your faithful friend delight in the great wet food. With it, your dog will be getting the 23 essential vitamins and minerals to support his overall health and wellness. Each case contains 12 13.2 oz cans and the dogs love every bite of them. Plus, the dog food smells really good and feels like a big expensive treat for any dog out there. Vovoly Food Bowls For Dogs – The two pet bowls are made of stainless steel accompanied by mat silicone which allows easy separation of foods and most importantly – easy consumption by your furry friends. AmazonBasics Stainless Steel Dog Bowl – Another set of two amazing dog bowl products which vary in size (making it great for all breeds of dogs). Made of stainless steel, these bowls will hardly dent or get scratched. Slow Feeder Dog Bowl Fun Feeder – If your dog is eating very quickly, you can buy this dog bowl and make their eating experience a lot more fun. Basically, this product splits the dog food in a nice way which allows more enjoying while eating it. In the end, the best way to feed your dogs is with a top quality dry and wet foods. With this kind of nutrition, the results are visible shortly after – in terms of shiny fur, healthy skin and a happy dog.